Increased harvest of forest biomass has the potential for mitigating climate change as well as reducing dependency on fossil fuels across much of the boreal zone. For forestry to be sustainable in the long term, the supply of weathering (chemical dissolution of minerals) needs to be sufficient to compensate for what is harvested and washed out by acid deposition. 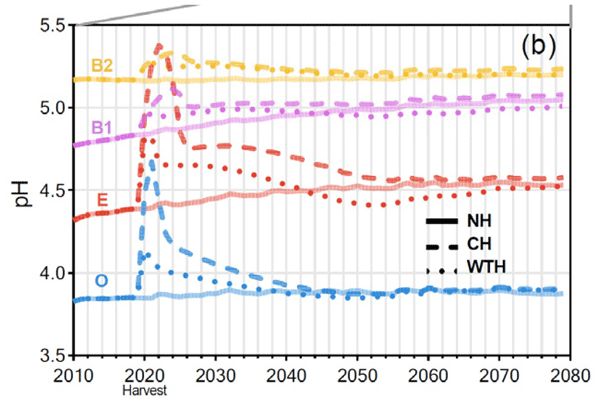 There are indications that current levels of forest harvest in boreal regions are not sustainable because soils are already being depleted of key elements in large areas, and increased harvest rates will be even less sustainable. This weathering deficit threatens both trees and aquatic ecosystems. But there is also a concern that weathering estimates are uncertain relative to the accuracy needed to guide forest policy. This special issue brings together key results and syntheses from a 5-year research programme involving six universities and two research institutes to improve weathering estimates at the spatial and temporal scales relevant to sustainable forest management, including how climate and forest management can affect weathering rates. discuss weathering rates and their importance for sustainable forestry and aquatic ecosystems in the context of other nutrient pools in the soil. Biofuel harvests from forests involve large removals of available nutrients, necessitating accurate measurements of soil nutrient stocks. We found that dilute hydrochloric acid extractions from soils released far more Ca, Na and K than classical salt-extracted exchangeable nutrient pools. The size of these acid-extractable pools may indicate that forest ecosystems could sustain greater biomass extractions of Ca, Mg, and K, than are predicted from salt-extracted exchangeable base cation pools. We examined the effects of elevated CO2, pine seedlings, and ectomycorrhizal fungi on mineral weathering. Seedlings significantly increased mineral weathering, while elevated CO2 increased plant growth and organic acid concentrations, but had no effect on weathering. Ectomycorrhial fungi showed some tendency to increase weathering. We conclude that nutrient uptake, which reduces transport limitation to weathering, is the primary mechanism by which plants enhanced weathering in this system. The release of base cations from mineral weathering is expected to increase in response to higher temperatures associated with climate change. By considering the effect of changes in moisture, this study shows that climate change will lead to an increase in weathering rates, but to lower extent than expected due to water limitation. The study uses an integrated forest ecosystem model that simultaneously simulates changes in soil and vegetation and the feedbacks between them. The present publication documents the kinetic parameterisation of the related PROFILE (steady state) and ForSAFE (integrated dynamics) models. It gives the full coefficient database for about 100 minerals occurring in most soils. The text outlines the principles and methods used in setting the coefficient values. It outlines how the models with the parameterisation based on laboratory kinetics, is successful in estimating field weathering rates similar to what is being observed. Effects of biological activity on mineral weathering operate at scales ranging from short-term, microscopic interactions to global, evolutionary time-scale processes. Microorganisms have had well-documented effects at large spatio-temporal scales but to establish the quantitative significance of microscopic measurements to field-scale processes, higher-resolution studies of liquid chemistry at local weathering sites and improved up-scaling to soil-scale dissolution rates are still required. In this study, we demonstrate how new equations describing base cation release from mineral weathering can reproduce patterns in observations from stream and soil water. This is a major step towards modelling base cation cycling on a catchment scale, which would be valuable for defining the highest sustainable rates of forest harvesting and levels of acidifying deposition. More reliable mineral weathering estimates are required to ensure sustainable forest growth. 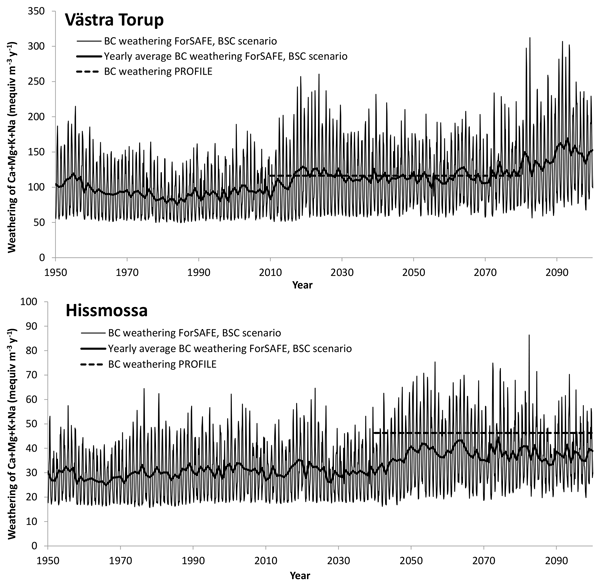 Thus, weathering estimates obtained by the three different methods were compared against other major base cation fluxes at ecosystem scale in N and S Sweden. The large discrepancy in weathering rates for Ca, Mg and K between mass balance and the other methods suggest that there were additional sources for tree uptake in the soil besides weathering and measured depletion in exchangeable base cations. Weathering rates in forest soils are important for sustainable forestry but cannot be measured. In this paper, we have modelled weathering with the commonly used PROFILE model as well as with the dynamic model ForSAFE, better suited to a changing climate with changing human activities but never before tested for weathering calculations. We show that ForSAFE gives comparable weathering rates to PROFILE and that it shows the variation in weathering with time and works well for scenario modelling. PROFILE base cation weathering estimates using the directly measured XRPD mineralogy compared to different indirectly determined A2M mineralogies (regional versus site-specific) were overall similar, however, the underlying contribution from different minerals to the overall rates differed. Descriptions of the dissolution rate kinetics of the plagioclase mineral group as well as major K-bearing minerals (K-feldspars and micas) should be improved for future soil and forest management studies. Aluminium and base cation chemistry in dynamic acidification models – need for a reappraisal? This paper investigates how different dynamic soil chemistry models describe the processes governing aluminium and base cations in acid soil waters. We find that traditional cation-exchange equations, which are still used in many models, diverge from state-of-the-art complexation submodels such as WHAM, SHM, and NICA-Donnan when large fluctuations in pH or ionic strength occur. In conclusion, the complexation models provide a better basis for the modelling of chemical dynamics in acid soils.